We are able to lift any size door with the help of garage door springs. The weight of the door varies from a light 150 lbs to a very heavy 400 lbs. The weight of the door varies because of the materials employed and the actual size of the door. Lightweight doors are usually made of aluminum while the heavier ones are made of solid wood or incorporate thick glass. 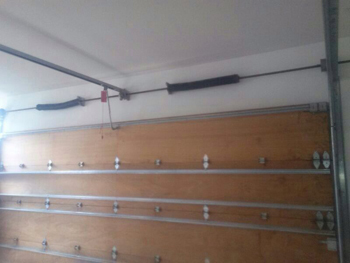 There are two garage door springs that are used in modern garages. The first one is the torsion spring that incorporates tremendous amounts of torque to produce the force necessary to move the door. This kind of spring is larger and longer. It's attached to a shaft that spins as the torsion on the spring decreases or increases. With this spinning or turning motion comes the shortening or lengthening of the cable attached to the door. This action is what lifts up or brings down the door in a controlled manner. The second type of spring that you can see is the extension spring. This type is different from the torsion spring in that it uses its elasticity and the power of its recoil to create the movement of the door. Most extension springs used are but a fraction of the size of the torsion spring so it's understandable that you would need more of them to produce the same effects. This is why there usually is a couple of extension springs used. Some doors may even use a couple of extension springs on each side just to produce enough power. Since springs are loaded with a lot of potential energy, there is a real danger of their unexpected release especially when they are mishandled or the right safety measures are ignored. So, the best thing to do when you have some concerns regarding your garage door springs is to call us at Garage Door Repair Ennis. We will replace old or broken torsion and extension springs with high quality parts and make sure your door is up and running perfectly once again.